If you love the look of old-timey incandescents, you should know that the classic Edison light bulb has gone LED. These vintage-inspired bulbs still have that beautiful old-fashioned look and even better are energy efficient. We asked celebrity designer Chris Stout-Hazard to share what you need to know about LED vintage-inspired light bulbs. "Edison bulbs are fascinating for a few reasons," says Chris. "The filament inside of them is what transforms them into illuminated art, so it's important to feature them in the right fixture." For example, you don't want to hide these beauties behind a lampshade. Tip: If you want to show off your Edison bulbs keep them dimmed. They will emit a warmer light that flaunts the filaments' squiggly glow. 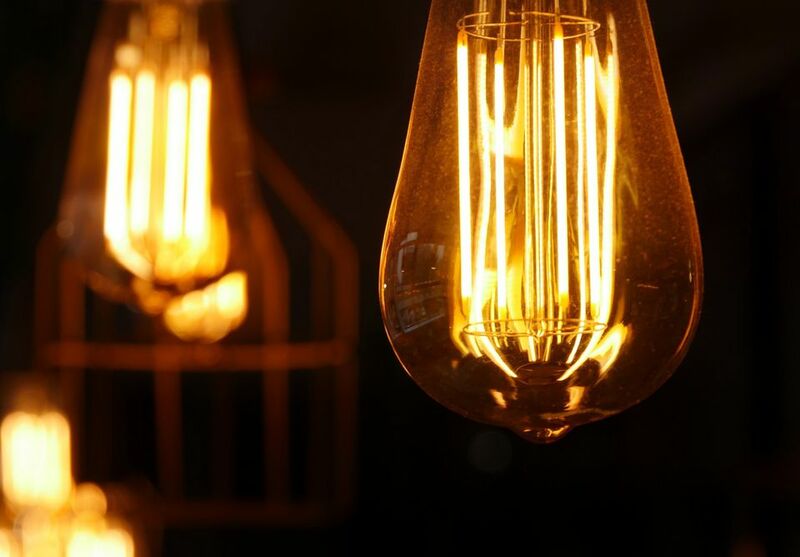 Edison light bulbs emit a cozy golden light. Their color temperature is why. A light bulb's color temperature is measured in units called Kelvins. Bulbs typically range from 2700K to 6500K. "Standard soft white incandescents burn at about 2,700K," says Chris. "However, Edisons are closer to 2,000K." The lower the Kelvin number is, the more yellow the light will appear. "Their vintage yellow glow adds to their uniqueness." LED Edison bulbs are great for ambient lighting, but no so much for task lighting. "They aren’t great to read by," says Chris. "They are, however, excellent accent lights that can help you relax." Exposure to blue, daylight-balanced light in the evening can negatively impact your sleep patterns according to several studies. Chris adds, "So having warmer light serves a practical purpose for keeping those circadian rhythms on schedule." Where should you place a lamp using one of these bulbs? "Because you wouldn’t typically rely on Edison light bulbs alone to light up a space, I would focus on keeping these bulbs lower in the room," says Chris. "A lot of the coziness we feel when gazing at a fire is mimicked with very warm light at low positions. Mix these with other light fixtures at higher positions and you will have a versatile mixture that can function for a variety of activities." Chris Stout-Hazard and his husband Roger Hazard are the dynamic duos behind the unboring and American made home furnishing line, Roger, and Chris. Many of the items in their insanely beautiful lighting collection feature LED Edison light bulbs. We asked Chris to share the skinny on a customer favorite, an adjustable height table lamp called Cranky. "I grew up in a very scientific family – my parents first years of marriage were spent together in organic chemistry classes, and we always had medical and lab equipment around the house. In fact, my dad and I built my first lamp when I was a kid using a mixture of industrial and scientific parts. Roger and I started our line of lighting, many of my designs called back to my love of this aesthetic. Cranky just seemed too fun not to build – everyone has adjustable lamps, but none quite like this – and our customers have agreed. It’s been one of our most popular pieces."